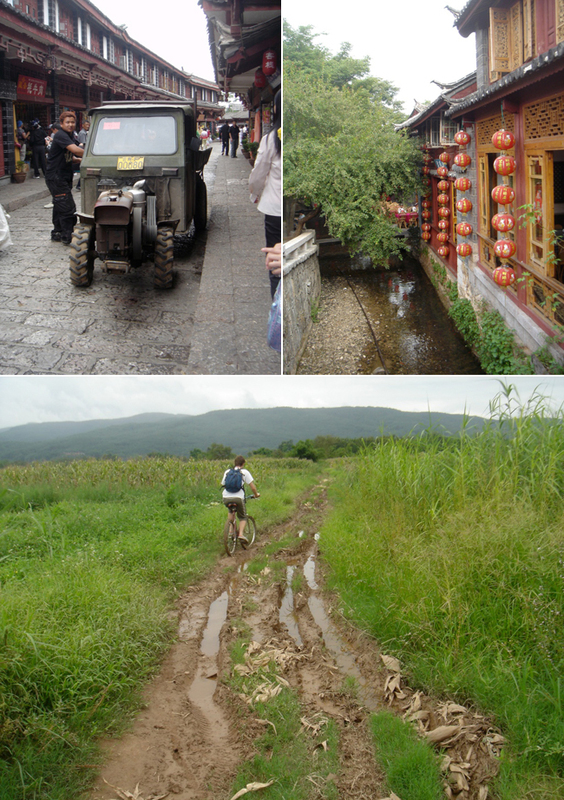 travel tuesday :: china 2005 | .liveit.loveit.blogit. Way back in 2004 and 2005 I was really adventurous. 2004 was the year I spent 6 months travelling by myself, and June 2005 was probably the high watermark of adventurous Al. I decided to take the (future) hubs way (way) off the beaten track into middle of nowhere China to go see a town I read about on the internet. A town that would later be submerged underwater by the building of a dam 40km downstream on the Wu Jiang Gorge. The hubs and my China adventures started when we both were exchange students in Hong Kong in early 2004 (at the ripe old age of 21 years). 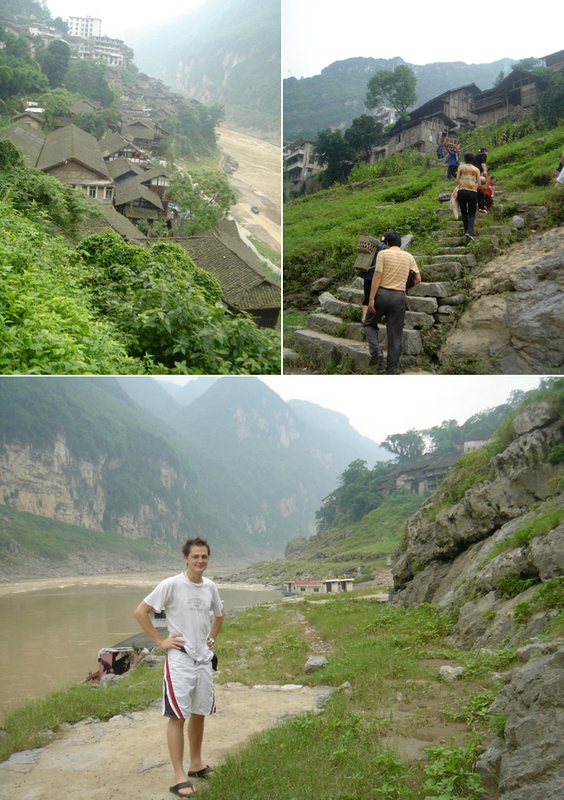 We covered a good part of Southwest China, both together and separately on various trips over this time period. In 2005 we decided to go back and spend about five weeks in China and Laos following the (future) hubs’ graduation from university, and before he started his career as a consultant and I law school. Back then I could speak some basic travel Mandarin, I’m not sure if we could have done this trip without it. In early June we flew into Hong Kong where we spent a couple of days getting our China visas, shopping, and getting ready for our trip. 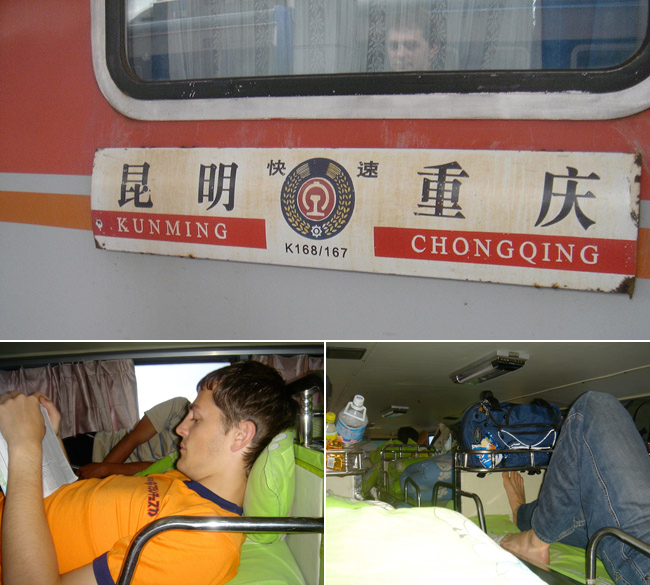 From Hong Kong we took the KCR to Shenzhen and the boarded a train for Zhangjiajie (张家界), a quintessentially Chinese national park that was designated as a UNESCO World Heritage Site in 1992. It was beautiful, and we saw maybe 2 other western tourists during our time in the park. 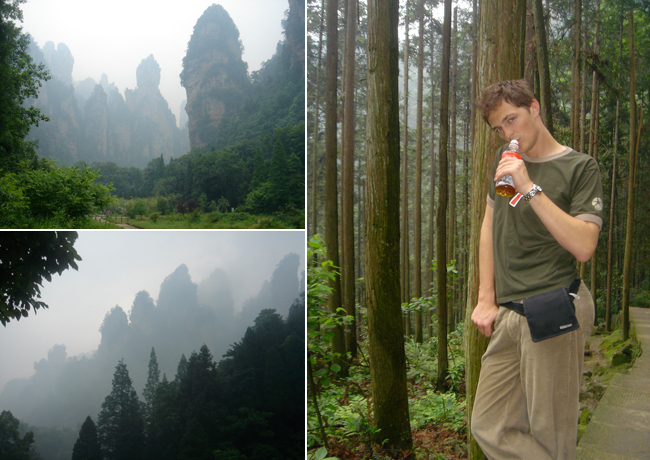 Zhangjiajie seemed surprisingly deserted on the hike up to the viewpoint. But when we got to the top we were mobbed with tour group after tour group after tour group of domestic tourists. Turns out the tour groups prefer the cable car! Zhangjiajie to Jishou (吉首) (by bus) to Youyang (酉阳… I think) (by bus) to Gongtan (by taxi). This day involved many a bus. Also, towns with multiple bus stations. Attempts at robbery. Crowds protecting (and helping) us. Holding babies. Late arrivals. And getting further and further and further away from the southwest China backpacker circuit. And at the end of this long and amazing (and trying) day, we arrived in Gongtan on the Wu Jiang (乌江) Gorge. And it was late. Very, very late. Our taxi driver dropped us off at the only modern hotel in town (since the proprietors of all the cute b&b style hotels/rooms in old houses were presumably sleeping, or possibly because why would we want to stay at an old place when we could stay somewhere new?) and we had a sleepless night. Our room was infested with thousands (or maybe even tens of thousands) of tiny little creepy crawlies. We don’t think they bit. And they weren’t gross individually. But in the thousands, they were so very gross. But we awoke to this wonderful view. A view which, it is crazy to think, has no longer existed since 2007. We had intended to stay longer in Gongtan, but type A travellers that we were, we thoroughly explored the tiny town in a morning and decided to move on that afternoon. We caught the afternoon boat down the river to Pengshui (彭水) which we shared with several local farmers and their bags of produce. And arriving in Pengshui, we boarded motos for Chongqing (重庆). Why we didn’t wait for the bus, I don’t remember, but thus began one of the craziest moto rides of my life to date (matched 3 years later by an equally crazy moto ride in Kampala). And yes. That is a fanny pack (or “bum bag” if you are English and easily offended). I used to travel with one back in the day. I would still if the hubs wasn’t so against it. But back to my story: after spending several days in middle of nowhere China, Chongqing came as a serious (and an awesome) shock to the senses. I loved it. I didn’t love the epic battle the (future) hubs and I had in the main square while trying to find our hostel, which in a somewhat hilarious twist of fate, stood approximately 15 feet from the scene of our battle. And hey… we’re married… so it clearly all turned out okay. But back to Chongqing. I loved the bustle-ingness, I loved the shopping, I loved the river port, and mostly I loved the burn-your-face-off street hot pot, one of my most memorable meals of life. And after a few days in Chongqing, we were off to Kunming (昆明) where we arrived and then immediately departed (ok… after dumplings…) on a long, long bus ride for Lijiang (丽江). I love me some top bunks of sleeper busses. 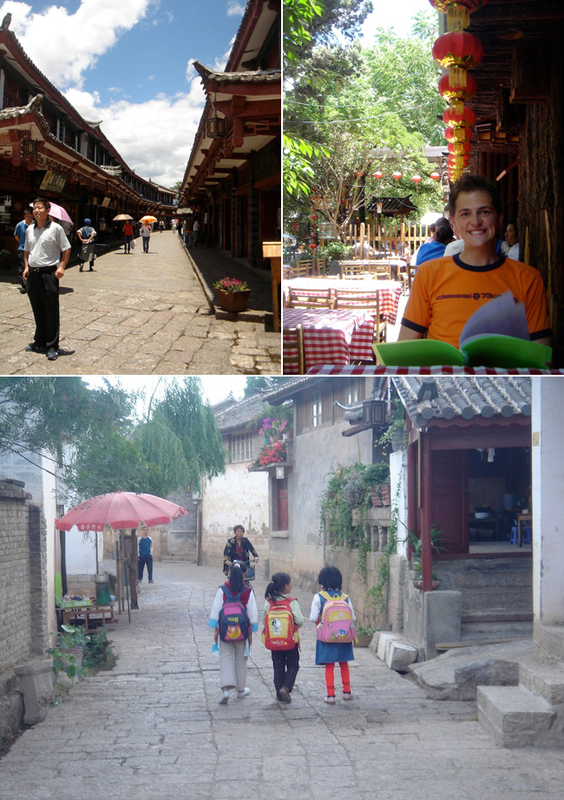 Lijiang was such a beautiful (and touristy) city. But seriously, how happy were we to be there. The weather couldn’t have been better. And Lijiang is (or at least was) one of the only places you would want to breathe deeply in China. And the whole point of going to Lijiang? (At least for us?) Well, this beautiful mountain city is the jumping off point for the Tiger Leaping Gorge (虎跳峡), which we hiked over two awe-inspiringly beautiful days. Because we had gone so far along the trail the previous day, day 2 of our hike was quite leisurely and filled with more beautiful views. And serious excitement at the end (this just happens to be one of my favourite pictures of us). Here is an excerpt from an email I sent to friends and family shortly before departing from Lijian, you will see that I haven’t changed much in tone (though I may have toned it down *just a bit*). CHINA IS GREAT! I love it here! We have been to some wild and crazy places,seen some wild and crazy things (too bad you can’t take pictures of experiences!). These have ranged from 6 hour bus rides to middle of nowhere china where truly we may have been the first caucasians to ever arrive there (a place that’s not in the Lonely Planet… talk about tough to get to!) 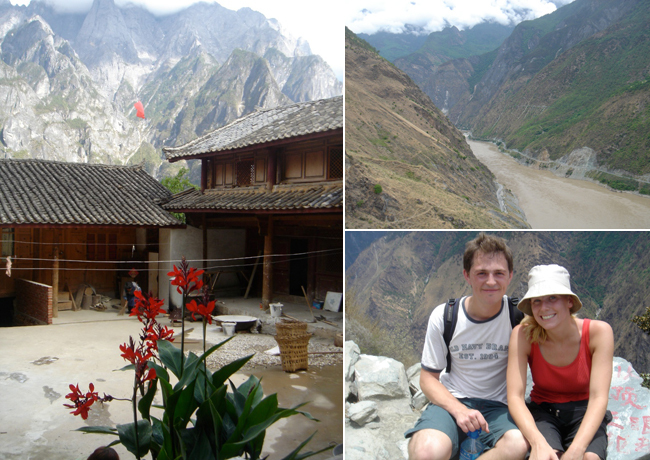 to incredible limestone pinnacles in a national park to the last experience in tiger leaping gorge… WOW, what a beautiful hike! We’re off from the lovely town of Lijiang tomorrow to Dali, then we fly to Jinghong in southern China and will cross the border into Laos within the next couple of days – it is just fantastic! The people are incredible, and my manadarin skills are improving daily! And onward we went to Dali. A small village that I had visited with some other friends in 2004. It was so fun to share this quaint little town with the (future) hubs, and was full of delicious tourist-track food (banana pancake, anyone?) and bike rides down muddy, muddy paths. When we left Dali, it was off to the deep south of China by air and by bus. This time to cross over into Laos. But that, my friends, is a story for next week! Still yet to do chian.